OrigamiUSA members will have the opportunity to participate in Convention 2015, even if they can't attend: Remote Classes! Using an online virtual class technology, you will be able to join selected classes remotely via the internet, with the option to ask questions of the instructor and interact with the other class attendees, as in on-site classes. When you register for a Remote class, you will receive an email with details, guidelines and instructions on how to attend the class. You will need a computer connected to the Internet and a browser that supports the web-conferencing platform (test instructions will be included in the email). 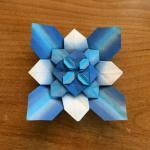 Remote classes have a $5 fee for each class and are available only to members of OrigamiUSA. Online registration for Remote Classes is now closed. 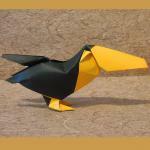 The model is a volumetric toucan from a blitzed fish base. 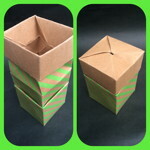 This is a fabulous one-piece container with a clever lid. There are at least 2 methods to fold this model, one diagrammed by Fujiomoto and one by John Smith. I will explain the differences, and present a hybrid method. The model is a Coyote with a playfully tilted head. 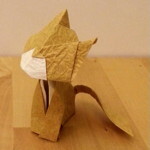 The aim of the class is to fold a cute cat. 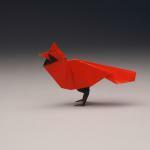 This is an intermediate model, best folded from red/black duo kami. I will present various different design techniques in general use, from simple modifications of existing models, grafting techniques, tree theory, and design through the assistance of origami software. Grafting techniques will be practiced in class. 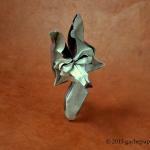 In 2012 the National Science Foundation awarded several large, 4-year grants to various research groups across the country in order to study origami. Specifically, these groups were charged to explore self-folding mechanisms and their applications in everything from deployment of structures in outer space to biomedical applications. In this presentation and discussion, Tom Hull will describe some of the new results and developments that have emerged from these grants, in particular the one he's been working on with physicists from Cornell University and the University of Massachusetts, Amherst, as well as origami math-science experts like Robert Lang, Tomohiro Tachi, Erik Demaine, Jeannine Mosely, and others. After a short introduction, Sara will open it up for questions from you. You can submit your questions at http://www.tricider.com/brainstorming/3PIYBPGYmpp (no registration required) - and voting on them. Or ask a question live during the session.